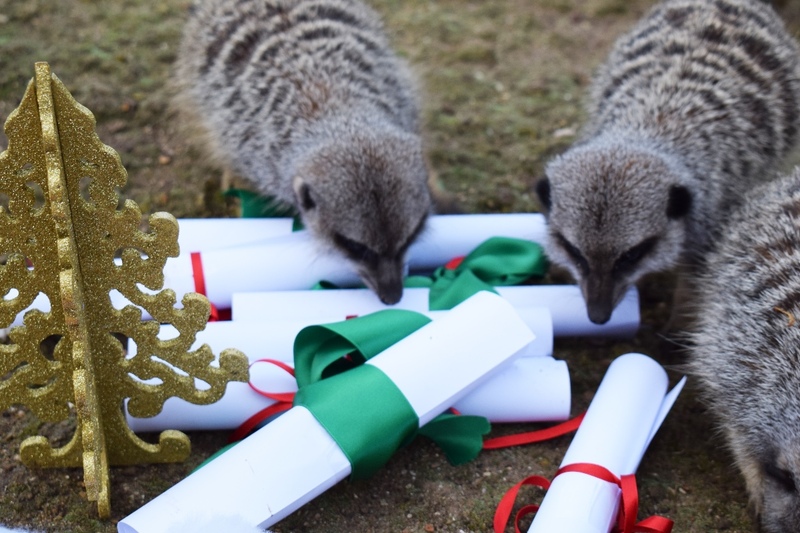 The mischievous meerkats at Drusillas Park have been busily mailing their wish lists off to the North Pole, in the hope that Santa will bring them a sleigh-full of festive treats this Christmas. 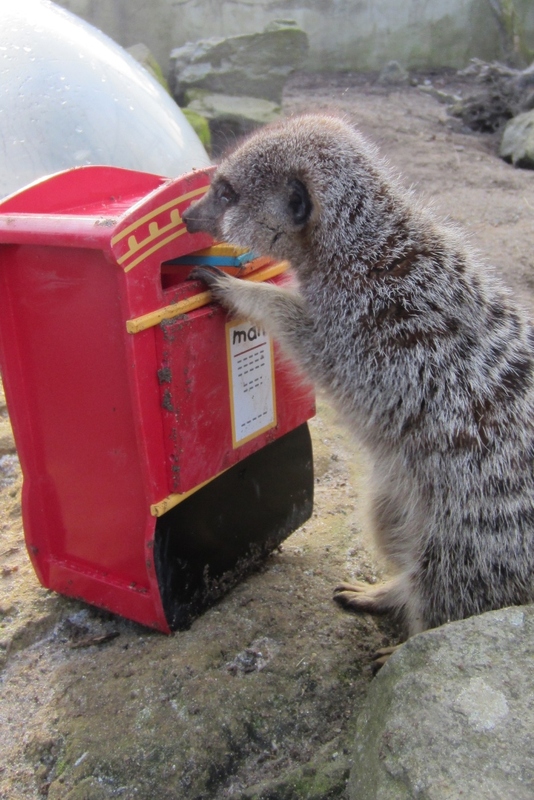 The slender tailed meerkats revelled with excitement as their keepers presented them with their very own wooden mailbox in which to post their letters. The special delivery was given as part of the zoo’s daily programme to stimulate the animals. Meerkats are naturally very curious creatures and enjoy exploring new and unfamiliar objects. They investigated the unusual offering with great enthusiasm, before posting their ribbon bound letters safely inside. There’s no doubt a selection of novelty nibbles is likely to be the top request amongst the group this Christmas. Meerkats enjoy a varied diet of both plants and animals with cockroaches, snails and boiled eggs all receiving a first class response at the zoo. 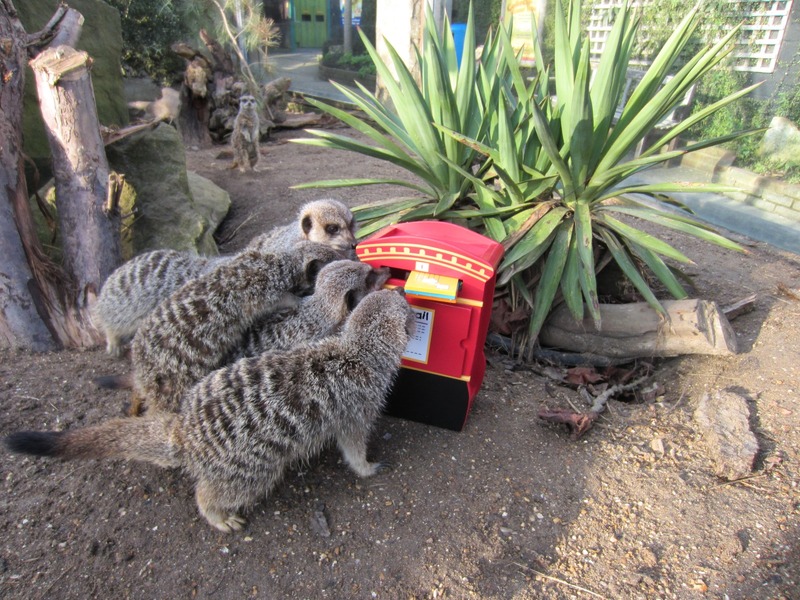 However in preference to a customary Christmas orange, the meerkats would rather have their own stockings stuffed with a generous helping of mealworms. Monkey nuts are also a firm favourite and always receive a cracking reaction. 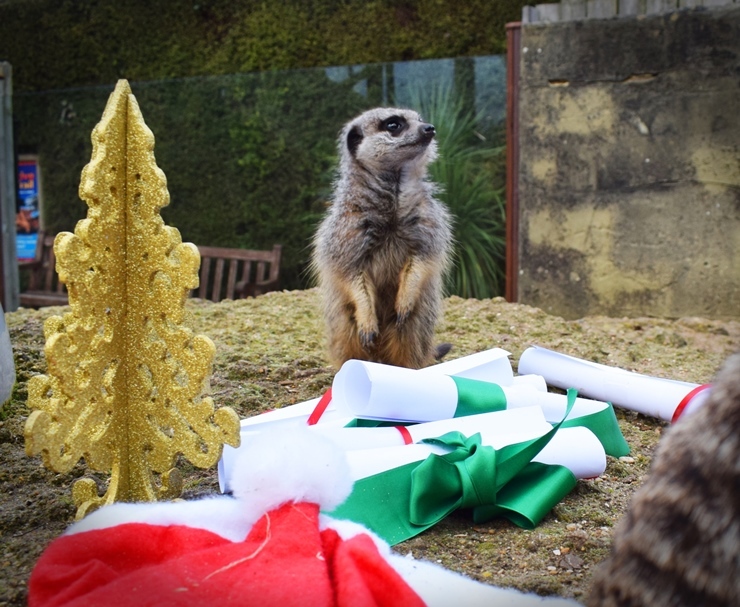 Paws crossed, Santa will receive the meerkats’ wish lists and the troop will be treated to a stocking full of Christmas goodies on 25th December. Get into the festive spirit with a trip to Drusillas Park this Christmas. There’s still plenty of time to visit their magical Winter Wonderland! Bring your little elves down to visit Santa, say hi to a husky and even watch the dazzling light display. For full details about Drusillas Christmas events please visit our Christmas events page.